So you got your new CNC and have no idea what the difference between a straight cut and a compression cutter is? That's ok, I was the same and I am sure everyone goes through the same motions. I have written a bit by bit guide on the most popular profiles available and will give you an overview of their capabilities. Just a caveat, the achievable results published here are based on the bits sold by Adam's Bits. These are because we've gone through some extensive testing under various conditions. Also, what works for others, might not for you of which therefore Adam's Bits is not liable for bit breakages and undesirable consequences as a result of using this guide. OK, we got that out of the way, let's go! There is only really one bit that you would want to attempt on plastics and that is the 1 flute up cut. 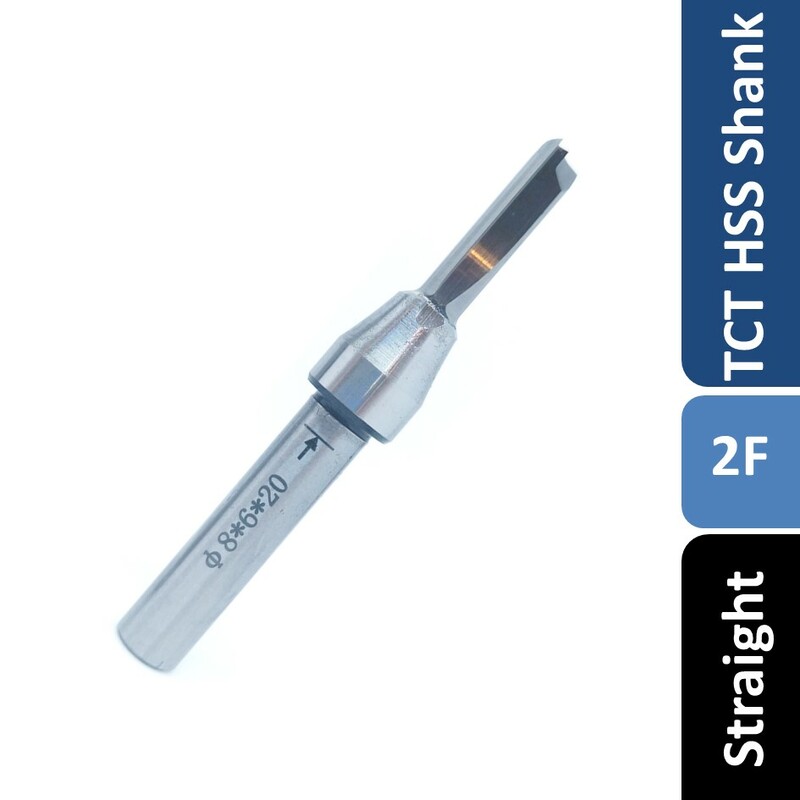 Also know and single or “O” flute, the one toothed up cutter allows for maximum chip ejection compared to any other bit and generates the least amount of heat. The combination of the two means that when cutting plastics, you avoid the nasty occurance of “chip rewelding” where plastic upon cutting heats up to the point it solidifies behind the cutter, rather than ejecting nicely. As these bits are purposely aggressive, using these bits on laminated woods like ply or softwoods would tear up your material and leave a heavily burred finished. To reduce rewelding, ensure your bit doesn’t heat up by driving your feed rate high and router RPM low. A 2 flute up cutter sports two cutting edges or “teeth” which now means that for every rotation of the bit, two edges will be cutting your material. Also known as “fishtail” or spiral up cut, these bits are like a traditional drill bit in which the spirals direct chips up . 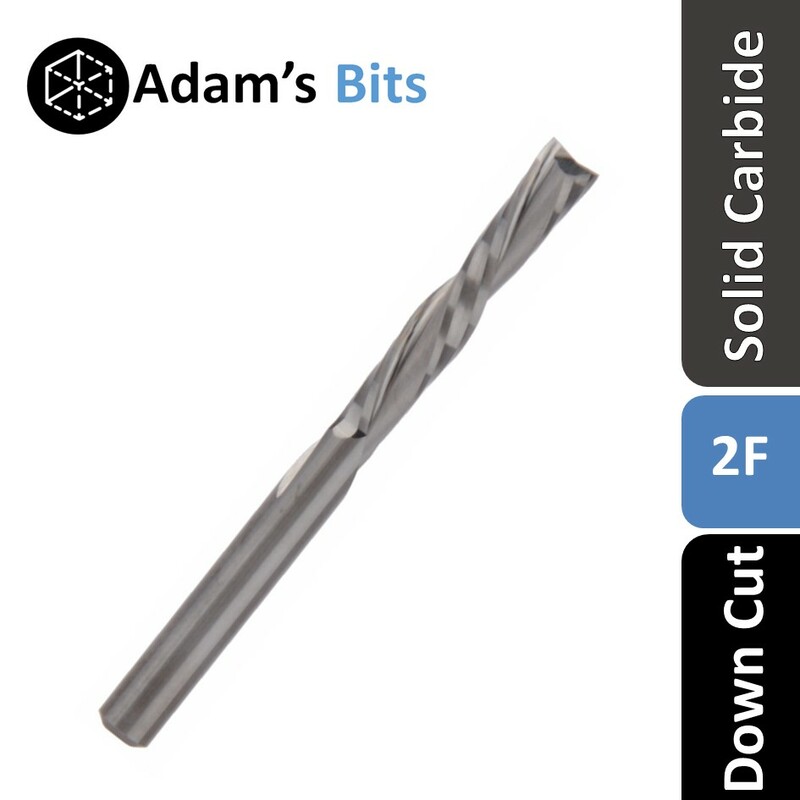 A benefit of a 2 flute up cut is that you can drive your bit twice as fast in feed than a single flute although with 2 flutes now occupying the cutter, the chip ejection is not as good. These cutters are primed for high efficiency cutting on woods but do leave a burr on the top of your material and a clean finish on the bottom side. Up cuts have a tendency to pull up the material you are cutting. Ensure that the you are using suitable hold down methods such as double sided tape, masking tape + super glue or clamps over a small area. Also watch out for cut parts popping up if you are using a dust boot. A spiral down cut has blades which forces chips down back into your material. This has benefits of providing a perfect top finish to any wood type especially plys and top finishes. 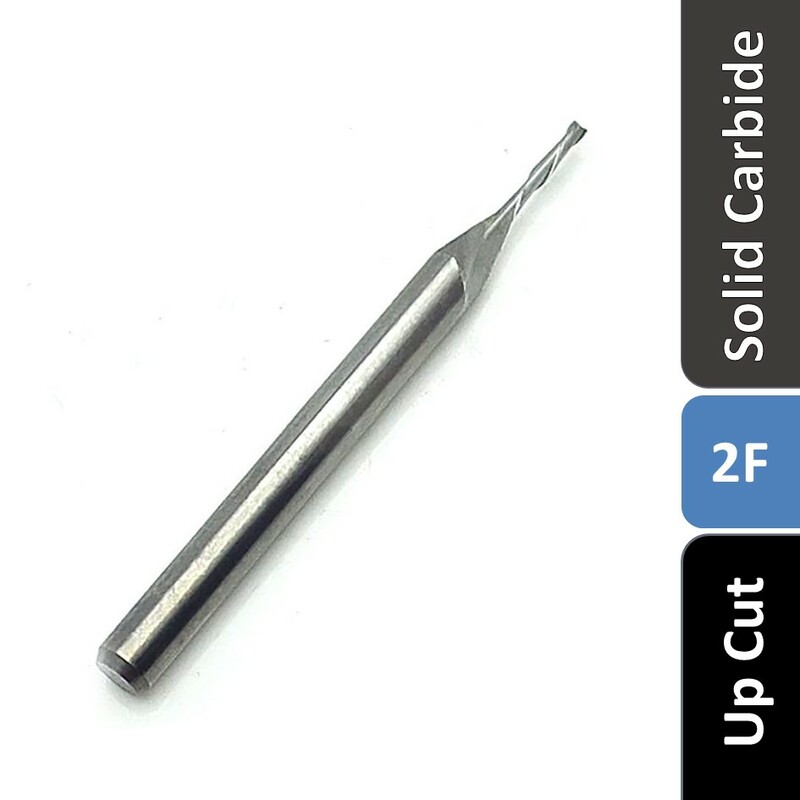 Made of a very high tungsten carbide material, down cut bits are the a weapon of choice in anyone's arsenal. Opposite to a spiral up cut, a down cut will give you a perfect top finish but a burred bottom finish. Therefore these bits are most effective for engraving & lettering rather than cutting all the way through. Just like a straight flute, a down cut creates a lot of dust as opposed to chips so make sure you have appropriate ventilation or dust extraction when cutting. On the plus side, the dust gets stuck and packed back into the slot you have made and keeps your cut item in place. This has the advantage of not having to use tabs or tape to hold your material down and cuts overall handling time but to the detriment of sanding the bottom of your material. 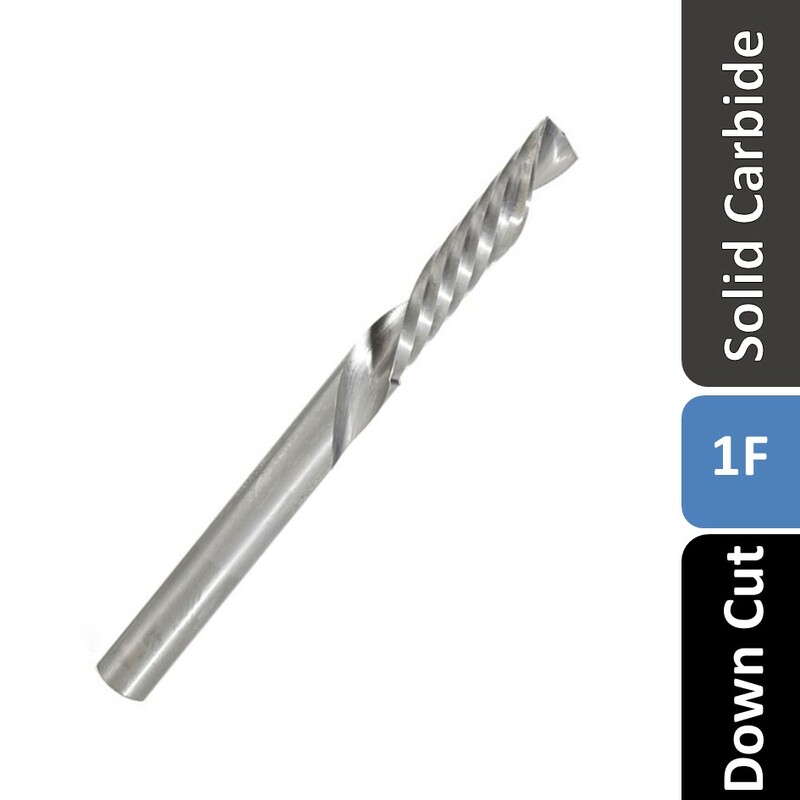 If an upcut gives you a great bottom finish and a down cut a great top finish, why not have both with a compression cutter! A compression cutter starts with an up cut component usually the length of the diameter (eg. ⅛” has a ⅛” up cut component and the rest to down cut) so get the full benefit of the cutter, your first plunge must go below that length (eg. ⅛” or more). Compression cutters like to run a bit faster than other wood cutting bit to get the best finish along the side of your material. Albeit compression bits are primarily used for slot cutting, you can still profile cut as long as you go past the up cut component. This will give you both a perfect bottom and top finish. A favourite of CNC enthusiasts is to 3D carve and a ball nose router bit allows you to do just that. 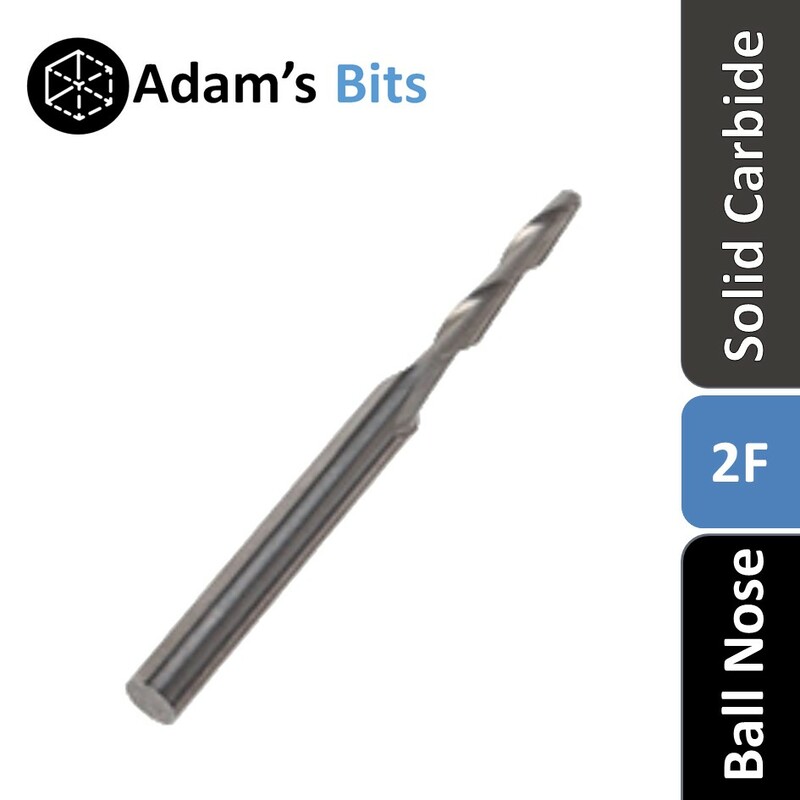 These are a great entry level bits as the are value for money compared to tapered ball nose. The radius = 1/2 of the diameter with no flat bottom. These bits can also be used to engrave lettering. Cutting against the grain reduces fuzzy material forming in your carve. This can be set in your 3D carving software under the term "raster". 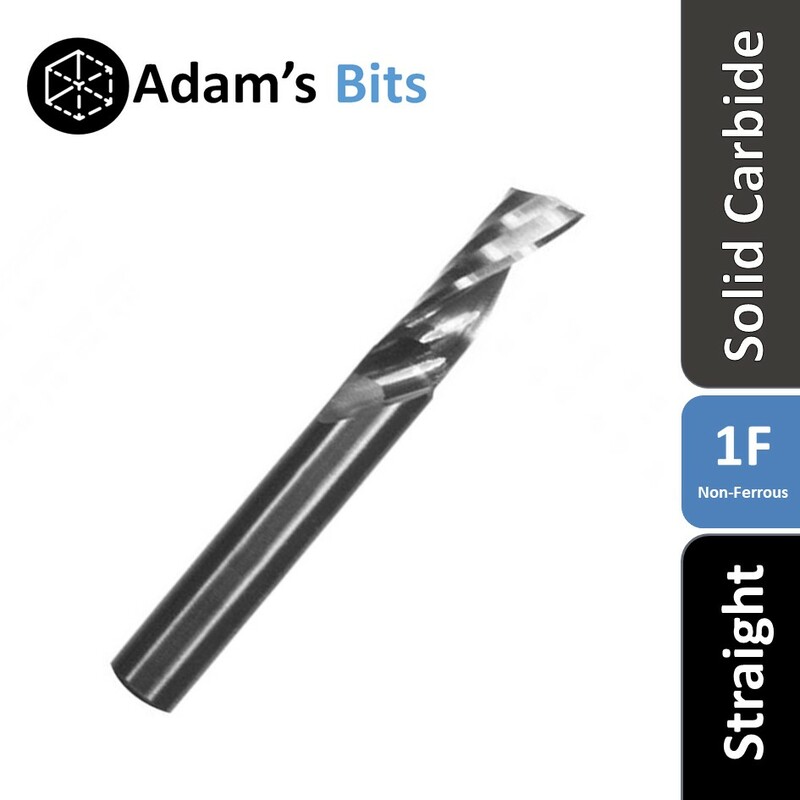 A combination of high quality carbide braised on an 8mm HSS shank, these router bits have gone through rigorous testing and customer feedback to give you a great cutter at an amazing price. These bits are designed for cutting MDF, plywood, soft and hard wood where you require speed and high efficiency. Go even harder with 3 flute straight with an innovative chip breaker profile that will slice through your material with a perfect finish. These are industrial bits and like to go fast. Going slow will reduce the life of the tool due to heat build up. The most versatile bit you need to have in your set is the tapered ball nose. 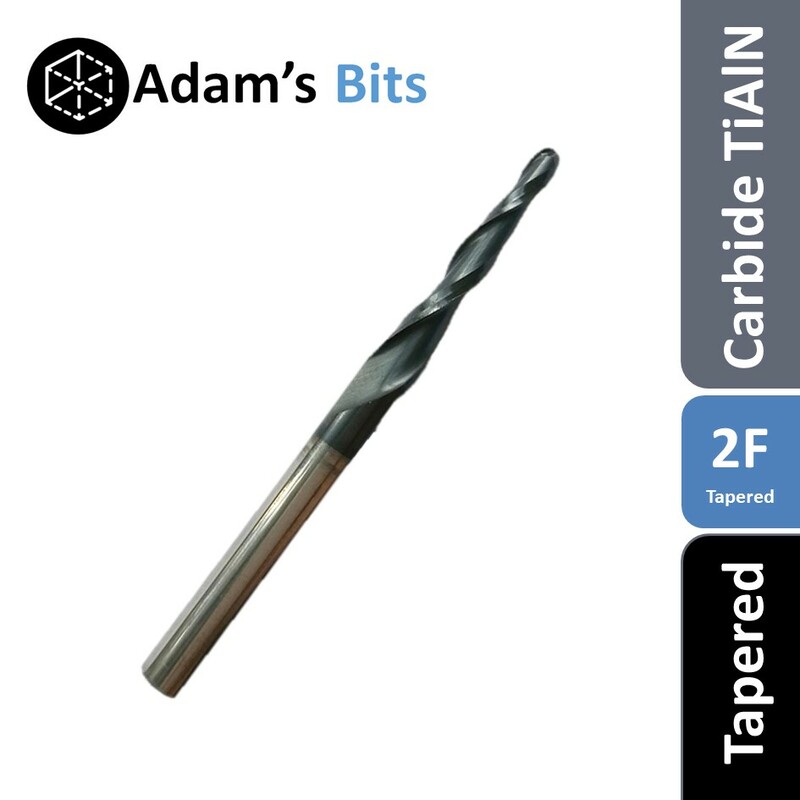 Capable of engraving wood, plastics, soft metals and even steel, these are a high quality bit and withstand a beating even with a R0.25mm tip. Some uses of this bit include cutting PCB tracks, engraving lettering in ABS or even steel plates, 3D carving of aluminum or brass and much more. Avoid a deep depth of cut to improve the finish of your material and increase the feed rate to make up for lost time. Also, use a lubricant when cutting soft metals or steel to ensure the cleanest finish. Used in sign-making and detail work, V-bits are great for carving intricate design in detail on a wide range of materials. V-bits add depth and dimension where the same result cannot be achieved with a flat bit. These are a 1 flute cutter so the finish on softer material will leave a slight burr. A V bit is a great alternative to a small diameter straight cutter in engraving very fine detail. Use a smaller degree bit with a finer tip to achieve width of cuts smaller than 0.5mm. It is advisable to test on some scrap your carve to dial in the desired result.